Practice is good. I don’t think most people will dispute that. 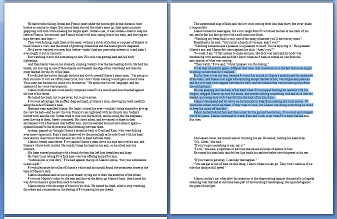 But sometimes I need to be able to visualize what improvement I’m working toward, so I highlighted 200 words of text in my current book in progress and took a screenshot of it. The blue highlight is 200 words of text in a standard 8.5×11 inch Word document with 1 inch margins in Times New Roman 12 point font. The screenshot is of a two page spread, giving me the most complete visualization of 200 words I think I’ve ever had. Here’s the thing: I want to consistently write at a pace of 800+ words per hour. It would allow me to write a reasonable number of words in a reasonable number of hours. I can type 60 words per minute without straining myself. With that goal in mind, 200 words is what I would expect of 15 minutes of writing and that’s what you see in that screenshot, a visualization of what I’m taking aim at in every 15 minute session I do today. Seeing it here, in this image, has really made me wonder at the nature of what’s holding me back when I write. I just can’t believe my brain creates story at such a slow pace that I struggle to create this much manuscript in half an hour most days. It’s difficult to understand. Unless I blame it on perfectionism. Then it makes all kinds of sense. For the particular selection of text I highlighted for this screenshot, it took me more than half an hour to get right. I know what text is there, nothing was particularly difficult to come up with, and I know it would take me about three to four minutes to type at my average 60 words per minute typing speed. Tying is not writing, that’s true. But I think much faster than I type so I’m not sure how that flies as an excuse for slow writing. So today I practice—in fact, I started practicing last night but was too tired to really give it the attention it needed.